Abalon is a leader in the industry when it comes to column and pad installations. 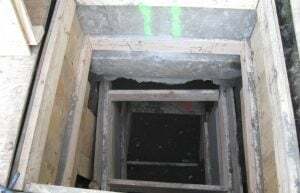 A column and pad system is a method of underpinning. Pad foundations are used when isolated loads need to be supported. For example, columns or framed structures. This system is generally used for lighter structures. Abalon can install pads in any type of terrain. Column and pads are simply an extension of the load bearing surface to below the frost line or at undisturbed soil elevations. A concrete pads is excavated out. The concrete pad is poured and then a poured concrete column goes from the new pad up to the underside of the structure being supported. This type of underpinning is used often on decks and porches as they are lighter than a portion of a house or building. Concrete pads can save money and time and can be installed in any type of weather. My front porch has four supporting post and one post has sunk, do I have to fix all four? No. If only one has sunk the post is more than likely on soil that is settling, generally near a sewer line. Our walk out basement is on a very steep slope, the supporting columns have sunk but I do not believe there is room for construction equipment. Can you fix this? Yes. Abalon can easily install columns and pads. All this type of work is done by hand. No need for equipment. Abalon has the experience and expertise in column and pad installations. Operating in Calgary since 1987, we have the crews, materials and knowledge to get your project done on time, on budget and to your complete satisfaction. Applies to Calgary and surrounding areas. *does not include Realtors or properties for sale.